The Eastern European Journal for Regional Studies (EEJRS) is dedicated to foster an effective interaction between innovation, education and research in the Eastern European Neighbourhood countries in order to better understand its transformations induced by European integration process. EEJRS is a two times peer-reviewed academic journal (June and December). It is a pleasure to announce the 8th call for papers for the pages of the “Eastern European Journal of Regional Studies” magazine, Volume 4, Issue 2. Please see a AUTHOR'S GUIDLINES for writing a paper. IMPORTANT! EEJRS does not charge submission or processing fees from authors. We look forward to receive your papers and invoke you to disseminate the call to other possible interested people. The Publishing Policy of the EEJRS aims to encourage the authors to express their most original opinions through their articles, reviews, and thoughts in various directions of the economic research. The responsibility for the originality of the papers/articles relies entirely on the author (s), who signs a Statement of non-plagiarism. 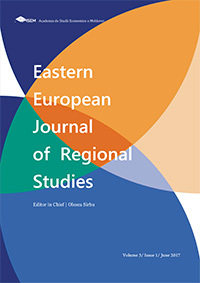 Eastern European Journal for Regional Studies (EEJRS) seeks to provide a forum for multidisciplinary and interdisciplinary dialogue between ideas, and a framework for theoretical and empirical analyses. EEJRS covers major topics related to European studies: European history and politics, European economy and European policies, EU community law, European culture and society, Regional Development, Eastern European Neighbourhood countries, Cross-border cooperation and development, Innovation and entrepreneurship development, Higher education and research. EEJRS aims at encouraging studies focusing on Central and Eastern Europe (including Eastern Neighbourhood) in order to better understand its transformations induced by the integration process and to address its specific challenges by supporting scientific debates on the general European theory and practice. Furthermore, the editorial board regularly coordinates thematic issues in order to stimulate productivity of research. Footnotes: footnotes (not endnotes) should be used only for relevant info & clarifications. In case you need additional information, please do not hesitate to contact us via e-mail: eejrs.csie@gmail.com (Contact person - Dr. Rodica CRUDU).